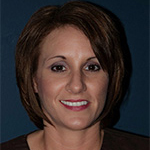 Richelle has been a member of our team since 1999 when she assumed the position of office manager. Her friendly voice and manner welcome patients to the practice as she makes the patients her number one priority, assisting with their dental treatment and financial concerns. Richelle works with the military prior to deployment. She also enjoys working part-time as a travel agent.